In a previous post I summarized findings from the Public Interest Research Group’s 2011 Annual Toy Safety Survey. In this post I focus on specific toys PIRG found to have safety issues that might be of interest to someone buying toys for an autistic child. 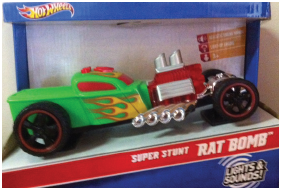 You can find the full list of danger toys in PIRG’s full report, Trouble in Toyland. PIRG’s lab tests found that the whirly wheel exceeded the federal lead standard of 300ppm and had a lead content of 3700 mg/kg of lead. Although in other posts I’ve talked about the benefits of wooden blocks and puzzles for autistic children, it’s important to remember that some of these toys can pose choking hazards, even when they are labeled as being for young children. 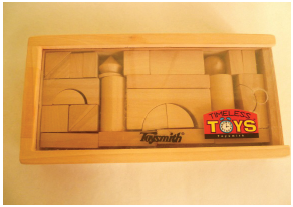 PIRG found that the ToySmith Wooden Blocks set had small parts even though it was labeled for children under the age of 3. In most cases plush toys are safe for children of all ages. 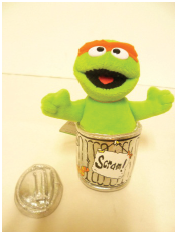 However, the Oscar the Grouch toy shows that you shouldn’t take plush toys at face value and should always inspect them thoroughly to determine if small pieces can be pulled off and present a choking hazard. For this toy, PIRG found that the toy’s hat comes off easily and presents a choking hazard. Besides teaching your kids the annoying habit of talking on their cell phones all day, this toy also presents a noise hazard for your youngsters. 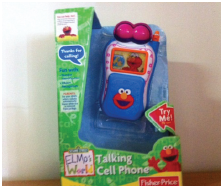 PIRG found that this Fisher Price toy exceeded the noise limit for close-to-the-ear toys, testing at 66-74 db versus the 65 db limit. Despite how cool this toy car looks, it’s not cool for the ears. PIRG found this toy to have continuous noise levels of 90-93 db, which exceeds the 85 db noise limit. PIRG’s findings reiterate the importance of doing your own research and using common sense tests to determine if a toy will be safe for your child, even if the age label says it is. This is especially true for when you are buying toys for low-functioning autistics who, as I discussed in a previous post, require toys several years below their age range. Any one have any other toys they would add to the list? Have you bought any of these toys? Please leave your comments!